Click the picture to be taken to the chevron signs in my TpT Store. 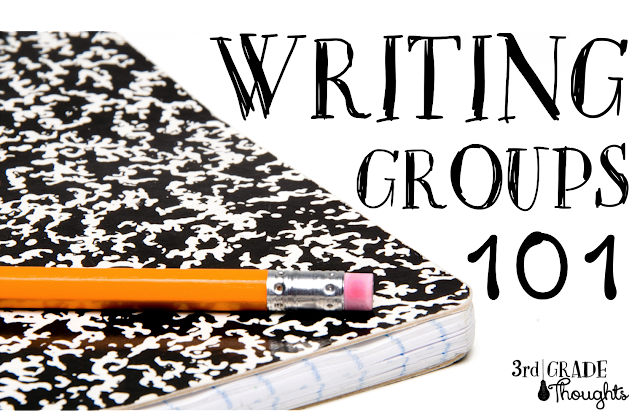 I decided first on the four groups I wanted to incorporate to help my students not just become better writers, but to get excited about purposeful writing again. As you can see, there are four different "groups" that my kids go to and they visit each twice a week. My writing time is only about 45 minutes long, so it ends up being close to 20 minutes in each session. It's definitely tight, but I have found that my teaching is much more intentional and targeted. 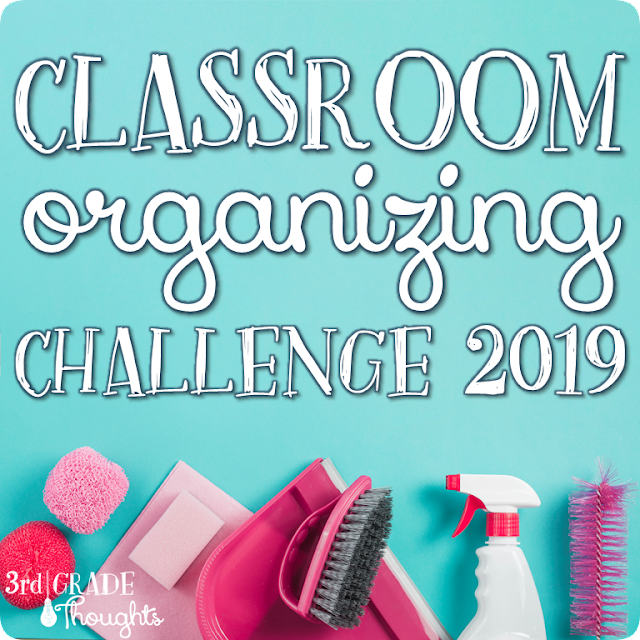 I meet with kids twice a week in Teacher Time and we are movin' movin' during our sessions :) Kids are broken into these groups by skill level, so I find myself being able to challenge my high kids easier and really get focused on what my strugglers need. One thing that helped me immensely was the addition of Mrs. Cooper to our room. She was assigned as a writing helper this year and it has been such a gift!! 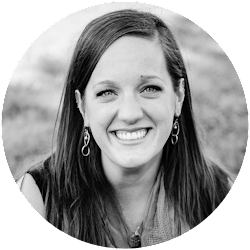 She is in charge of running the spelling groups and will use our school's spelling program and workbook with the kids. She also helps implement some differentiated lessons for both my strugglers and my advanced kiddos. Obviously, this is not a normal occurrence, so my original plan was to teach the lessons right before Writer's Workshop and then have the kids do the workbook activities to reinforce what we just went over. Or, they could work on handwriting practice (we teach cursive in class-- do you all still teach that? I love it!) instead. This is different than Daily 5's Word Work, since that is more grammar-based and Spelling Practice is all about rules, patterns, and the specific list of words that are tested at the end of the week. One thing I really committed to this year in writing is *Share*Share*Share* every.single.day. I want kids to feel their writing is important and get used to writing, presenting to an audience (which is a great leadership skill we talk about in 7 Habits), plus they love it! Best of all, it gets kids back together in the larger group to hear writing of all skill levels, not just their own that we've been working on in Teacher Time. 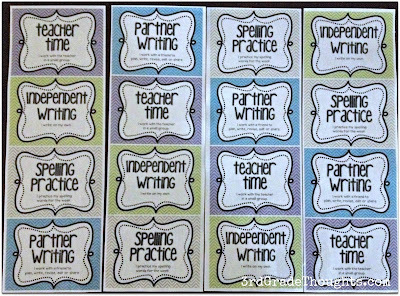 I realized that I was the one who needed to remember to include sharing, so I have been intentional about always carving out 5 minutes at the end of each Writer's Workshop time. In Part 2, I will explain each part more in-depth, but I am so excited to give you this initial overview and help wrap your head around the big picture. I do have these chevron signs in my TpT Store and they, like the Math Rotations signs, also have Rotations One-Four and Groups 1-4 signs in each of the seven colors, as well as a background-free option. Check back for Part 2 soon and have a wonderful weekend!! What a great idea! So this means that you do Daily 5, Math Rotations, and Writing Groups everyday? Is there any time leftover for science and social studies? 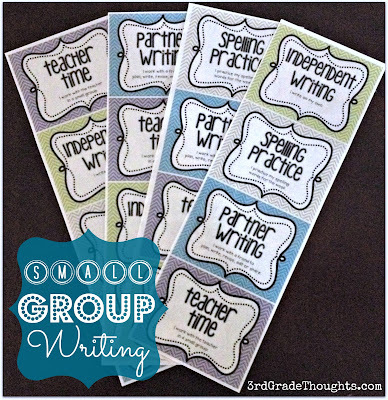 :) You said you give Writing GRoups 45 minutes, how long do you do Daily 5 for? Also, I was wondering where you get your writing lessons for Teacher Time? Is it just based on what you see in that group's writing or do you have something you follow for direction. This is my first year teaching 3rd grade and I am the only 3rd grade teacher at my school. Thanks for your help! Great questions and I will definitely go more in-depth with a few of them in my upcoming posts. To quickly answer them, I completely get how time is short!! There are some days where we will squeeze social studies or science writing in the mini-lessons, but I also leave a *lot* of time on Fridays, too. 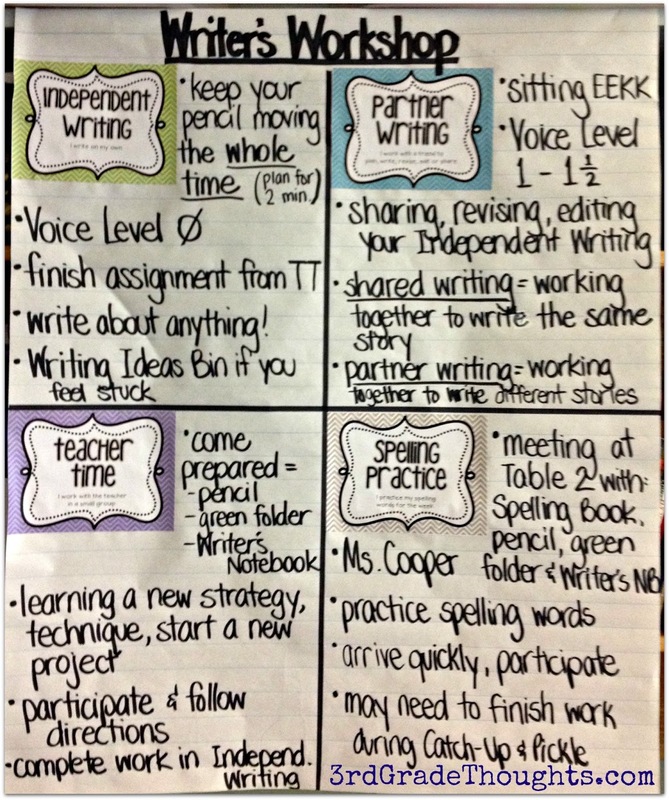 Since this is only a M-Th schedule, we can be very flexible on Fridays :) Our school uses Being a Writer, which is just ok in my mind, so I will add in mini-lessons that I have created or pull from other resources I've acquired over the years. Thanks so much for stopping by and maybe I will post a weekly schedule so you can see how my days usually go. Thanks for the idea! 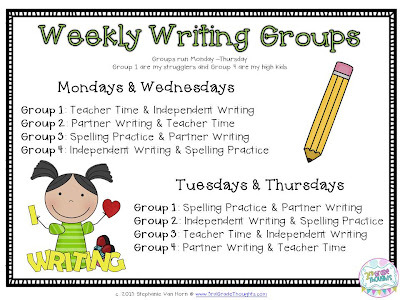 Love the idea of writing groups but I have nooo idea where to fit in writing in our already packed to the brim schedule... we're to the point of doing a writing activity when we have a short week since we don't do spelling and grammar that week. I do love the idea of having it, though! Ugh, I totally get it!! There's only so much time in the day and with my current schedule, there are some days we are squeeeeezing it in, then running off to specials :( Our school goals reflected the need to focus on writing (our scores kept falling), so I definitely made it my mission to put it in, but it sometimes includes content writing or very assigned writing (not just the craft of writing lessons) just to keep ourselves caught up!! I love meeting with small groups also...I learn so much about my students! 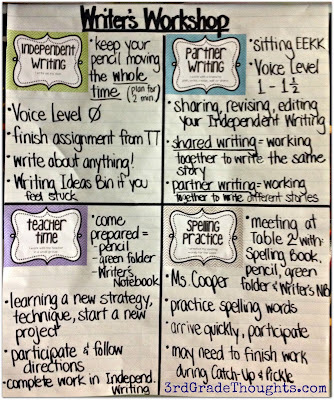 I still teach a whole group writing lesson, but then meet with a small writing group during independent writing to help those students work on our skill for the day. After writing that is the group that gets to share their writing with the class. I have 4 groups, so I meet with the lowest group twice a week. I love that schedule, Melissa! Thanks so much for your comment and have a wonderful weekend!! What an awesome idea! I would love to implement this with my fourth graders! We only have about 35 minutes for writing, but I feel like I could make it work! I think it's completely doable in 35 minutes, Melissa! In fact, I have found the kids stay more engaged with the shorter work time-- to a 9 year old, more than 20 minutes can feel like forever ;) Stay tuned for more info and I am excited to hear this can help! Thanks for sharing your ideas. 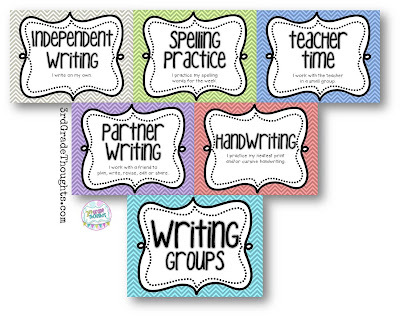 I have seen where small group instruction really is more beneficial for many of my students. I struggle with time management, but this was just the inspiration I needed to make myself do it! I never thought about having a parent help out with my spelling/word study instruction. 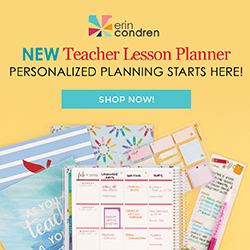 You already gave me a great idea to help me get started!